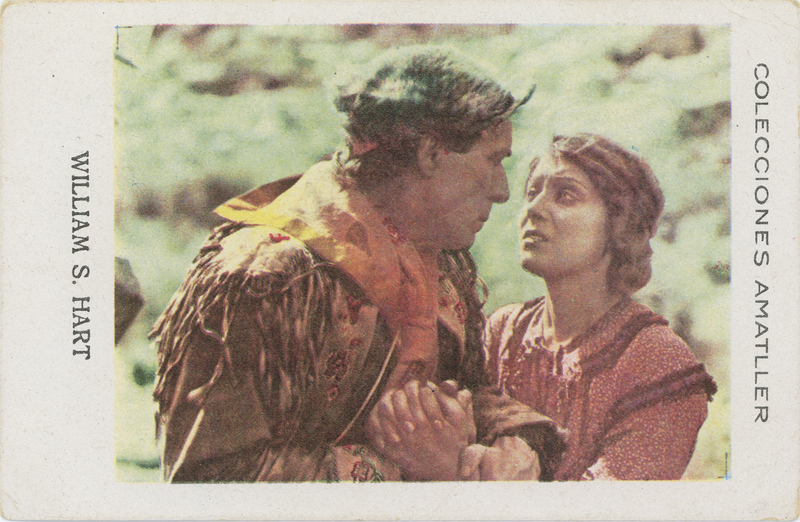 SCVHistory.com LW3065 | William S. Hart | Spanish Chocolate Trading Card: Hart and Jane Novak (and Pola Negri), 1920s. Chocolatier Amatller of Barcelona issued several series of movie star souvenir/trading cards in the 1920s. This one shows William S. Hart with Jane Novak, probably in a scene from "The Tiger Man" (Paramount 1918) or "Wagon Tracks" (Paramount 1919). The text of the card (at right, and below) is peculiar. It doesn't mention Novak, but it does discuss another one of Hart's love interests du jour, Pola Negri. Hart romanced many leading ladies in the 1910s and 1920s (and probably earlier) but married only one: Winifred Westover in late 1921. Westover may have been a rebound from his very public affair with Jane Novak, and the marriage didn't last more that a few months. We're not aware of Hart and Negri ever sharing the screen together, but she was no stranger to Hart's Horseshoe Ranch in Newhall, which he purchased in 1921. That same year, Negri arrived in the United States under Paramount contract (as was Hart). Born Apolonia Chalupec in Poland in 1897, Negri had risen to stardom in German-language films before becoming the first major European movie actor to cross over to the U.S.
Before building his mansion in 1927, Hart split his time between his home in what is now West Hollywood, and Newhall on weekends. "He enterained a few close Hollywood friends like Will Rogers, Harold Lloyd and Pola Negri at the ranch on Sunday afternoons" (Davis 2003:146). "We loved the excursions to the old West we had grown up with in novels and old movies," Negri said. "Bill worked very hard to give [his] place and air of authenticity" (ibid.). Naturalmente que no piensa retirarse solo a la vida rural, y antes de hacerlo quiere casarse con una mujer capaz de compartir felizmente con él aquella vida que constituye su suprema aspiración. 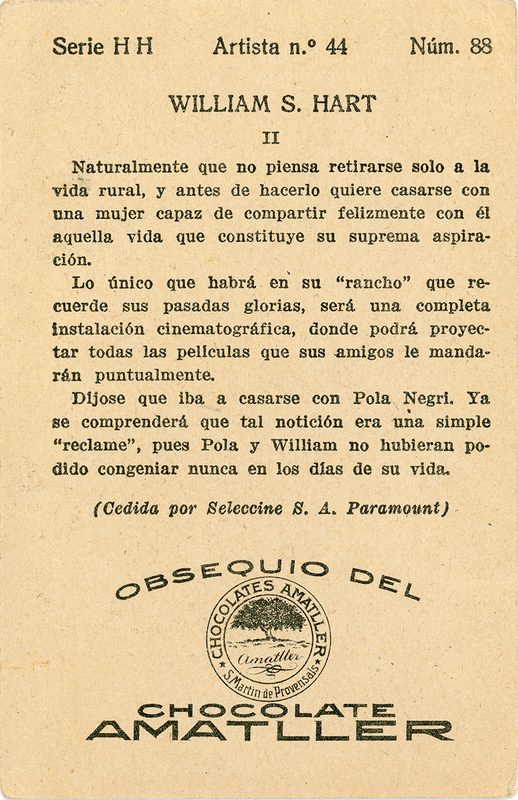 Lo único que habrá en su "rancho" que recuerde sus pasadas glorias, será una completa instalación cinematográfica, donde podrá proyectar todas las películas que sus amigos le mandarán puntualmente. Dijose que iba a casarse con Pola Negri. Ta se comprenderá que tal notición era una simple "reclame," pues Pola y Wílliam no hubieran podido congeniar nunca en los días de su vida. Naturally, he does not intend to leave rural life alone, and before he does so he wants to marry a woman who can happily share with him the life that constitutes his supreme aspiration. The only thing that will be in his "ranch" that remembers his past glories, will be a complete cinematographic installation, where he will be able to project all the films that his friends will send to him punctually. He said he was going to marry Pola Negri. It will be understood that such a notion was a simple "claim," for Pola and William would never have been able to fit in the days of their life. LW3065: 9600 dpi jpeg from original card purchased 2017 by Leon Worden.